Riccardo Giacconi, very recently retired President of Associated Universities, Inc. (AUI), will be awarded the National Medal of Science by President George W. Bush on March 14, according to the White House. Giacconi, who received the Nobel Prize in Physics in 2002, will be honored for his pioneering research in X-ray astronomy and for his visionary leadership of major astronomy facilities. Established by Congress in 1959, the National Medal of Science is the Nation's highest honor for American scientists and is awarded annually by the President of the United States to individuals "deserving of special recognition for their outstanding contributions to knowledge." "We are extremely proud that Riccardo Giacconi has been selected to receive the nation's highest award for scientific achievement," said current AUI President Ethan J. Schreier, a long-term colleague of Dr. Giacconi. "It is another fitting recognition for an outstanding scientific career that has enhanced our basic understanding of the universe," Schreier added. Giacconi, known as the father of X-ray astronomy, used X-ray detectors launched on rockets to discover the first cosmic X-ray source in 1962. Because X-ray radiation is absorbed in Earth's atmosphere, space-based instruments are necessary to study it. Giacconi outlined a methodical program to investigate this new X-ray universe and, working with his research group at American Science and Engineering, Inc. in Cambridge, Massachusetts, developed the first space satellite dedicated to the new field of X-ray astronomy. Named Uhuru, this X-ray satellite observatory was launched in 1970 and subsequently discovered hundreds of X-ray sources. The ground-breaking work of Giacconi and his group led to the discovery of black holes, which to that point had been hypothesized but never seen. Giacconi was also the first to prove that the universe contains background radiation of X-ray light. 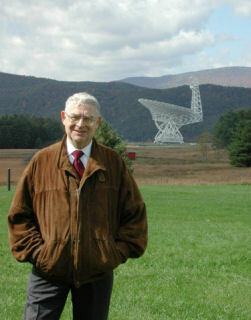 Riccardo Giacconi has played a key role in many other landmark astronomy programs. He was the Principal Investigator for the Einstein Observatory, the first imaging X-ray observatory, and led the team that proposed the current Chandra X-ray Observatory. He became the first director of the Space Telescope Science Institute, responsible for conducting the science program of the Hubble Space Telescope. He later moved to Germany to become Director-General of the European Southern Observatory (ESO), building the Very Large Telescope, an array of four 8-meter telescopes in Chile. While Director-General of ESO, Giacconi initiated a new cooperative program between the United States, ESO, and Canada to develop and build a large array of antennas for radio astronomy, the Atacama Large Millimeter Array (ALMA), in northern Chile. Giacconi was President of AUI from 1999 to 2004, managing the world-class National Radio Astronomy Observatory (NRAO), an astronomical research facility of the National Science Foundation. During his tenure, Giacconi's scientific vision dramatically advanced the observatory's capabilities. NRAO began the construction of ALMA in Chile and also the Expansion of the Very Large Array (EVLA) in New Mexico, opening new scientific frontiers across the entire radio spectrum. "I am delighted that Riccardo Giacconi has received this recognition," said NRAO Director Fred K.Y. Lo. "The value and impact of the multi-wavelength astronomy which he enabled has been nothing short of revolutionary. This honor recognizes Giacconi's contributions to astronomy and the broader scientific community." Dr. Giacconi is currently a University Professor at Johns Hopkins University in Baltimore, and remains a Distinguished Advisor to the Trustees of Associated Universities, Inc.